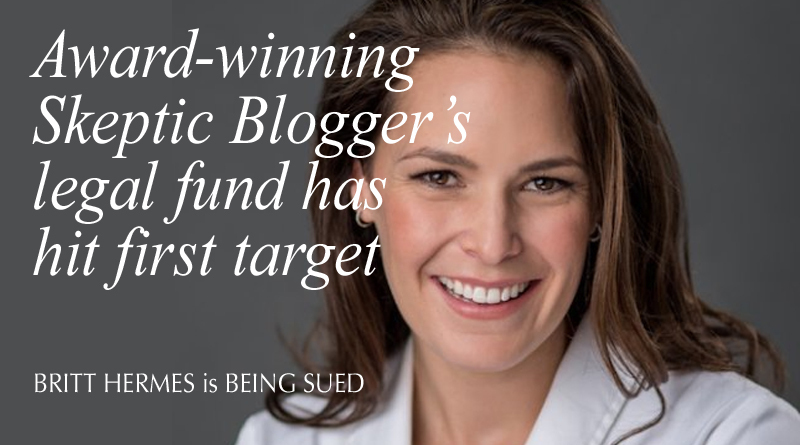 Award-winning skeptic blogger Britt Hermes – who turned her back on naturopathic ‘medicine’ – is the subject of a lawsuit by Arizona naturopath Colleen Huber. The defamation suit has been issued in Germany, where Hermes and her husband live and study. Hermes writes that Huber has taken issue with “… my opinions about her so-called natural cancer treatments and research”. As PhD students, Hermes and her husband are at a huge financial disadvantage against a person with a business. Hermes needs your help for legal defence, and Australian Skeptics have stepped in to coordinate a legal defense fund. For the full story, go to Hermes’ account on her blog. Australian Skeptics was able to confirm that the initial target was achieved in just nine days. But remember to keep giving: this fund will cover costs for the time being, but legal matters can get complicated and expensive.